As humans we relate more easily to things we experience firsthand. Everyone knows the feeling, that sharp, throbbing pain. We make the obligatory “Ooo” sound, give them some space and then say things like: “oh, your poor thing”. If we are feeling particularly good natured we might even offer to make them a cup of tea. We experience this empathy because what has just happened is within our realm of experience. We’ve all done it, we’ve all felt it and we get it. But what about when we’re dealing with something a little less clear? Something where we’ve sort of had an experience in that area… but not exactly. Like back pain for example. … and all the side effects that come with it. The headaches, the mood swings, the nausea which may come with taking too many painkillers. You may not be able to relate to it directly yourself, but you know it’s a thing. You have friends, colleagues or family members who suffer with chronic back pain and you know that it’s real – so you can feel some sympathy. 1. Empathy: When we have direct experience of something another person is going through. 2. Sympathy: When we have indirect experience of something another person is going through. (This could be through conversations with others or through reading or research). Both of these require either experience or some level of understanding. Now let’s do something drastic… let’s remove both experience and understanding from the equation. To most people misophonia simply doesn’t make sense. Sound causes pain, frustration, anger…? Really? Whaaaaat? It like being told that the hat you are wearing on your head is causing someone else physical pain. That’s how strange it sounds to people who don’t have or aren’t familiar with the disorder. Both sound pretty unusual if you have never experienced that sensation or studied either condition. There are some elements of misophonia that people without the disorder can relate to instantly. It’s the secondary feelings like anger, frustration, fear and upset which we can feel during a misophonic episode. These are emotions and feelings that everyone, the world over, recognises. Unfortunately that’s also a problem. Misophonia is not an anger disorder. Here’s a definition of an anger disorder from someone who has spent a lifetime studying anger disorders. The key bit to note here is ‘chronically repressed anger or rage’, or in other words, stored up anger. This is a different disorder altogether. There is no more anger ‘in’ someone who has misophonia than there is ‘in’ someone who hasn’t. This confusion, while understandable, is extremely detrimental for sufferers. It stifles our progress in explaining and developing treatments for the disorder. It also makes it much harder for parents and loved ones to help. Let’s put misophonia to one side for a moment. Imagine for a moment you have a disability which requires you to use a wheelchair. It’s a cold, wet Monday morning and you’re heading off to a job interview you’re excited about. You’ve woken up early, got everything ready and planned your route so that you can get there on time. But as soon as you get onto the platform you realise you’re trapped. You look around frantically and realise that there’s no wheelchair access at all. The only way to get off the platform and out onto the street is via a huge flight of steps and there’s no one around to help you. Even if you could find someone it would take at least 15 minutes to get both you and the chair up that flight of steps. Whatever happens, you’re going to miss your interview. In that moment you feel a rush of panic… and then a wave fear and anger and frustration. Fear that you are stranded… anger and frustration that you have no control of the situation. The reason you feel all these things is because you’re in a hostile environment. Again, this is a scenario that you have no control over. You can’t magically make your legs work and you can’t control the landscape. If you were to swear, or bang your fists, or cry, this wouldn’t be ‘weird’, it would be completely understandable. To accuse you of having an ‘anger disorder’ in this scenario would be unfair. You’re in a vulnerable situation (through no fault of you’re own). You’re panicked and frustrated. When people are panicked and frustrated they have an emotional response. It’s the same for the misophone. * This is the most widely accepted theory backed by recent studies. I’m going to get all neuroscienc-ey on you now but bear with me, because this stuff is important. 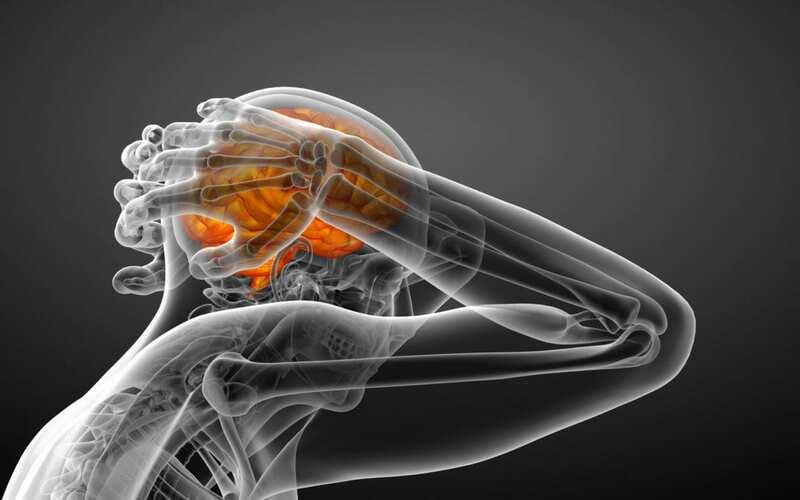 Misophonia is a hypersensitivity to certain aural stimuli (specific sounds) in the amygdala. It’s one of the most ancient parts of the brain and it’s responsible for threat detection. When the amygdala processes a sound that it perceives to be a genuine threat it throws the alarm switch. This is very important. It’s not something you can switch on or off manually. It’s not a choice, not something you can make a conscious effort not to trigger. When this alarm is raised it sets off what’s known as the ‘freeze-fight-flight’ response. This is the exact same response we experience when we’re in imminent physical danger. For example if you’re suddenly confronted by a man with a knife. Different stimuli may be involved but it’s the same neurological response. People with misophonia have a hypersensitivity to certain sounds. Imagine the gain dial on a microphone turned all the way up and tuned into a certain frequency. This is your brain. For someone with misophonia, the way our brain receives and processes this sound information is amplified. That’s why the freeze-fight-flight response is triggered for seemingly ‘nothing’ sounds. Now, we don’t know exactly what shape this hypersensity takes at this stage. It’s likely to be either the sound going into the amygdala (the input) or being processed by it (the output). Within that there are deeper questions still. Whether it’s timbre of certain sounds… the frequency… the repetitive pattern… or a combination. It could also be linked with synaesthesia and an involuntary linking of different senses. There are specific studies taking place right now which are trying to address these questions and I’ll update you as soon as I know more. Let’s finish up with another parallel. I want to drum home how absurd it is to view misophonia as an anger disorder. Imagine you have appendicitis and someone keeps poking you in the appendix. Apart from the obvious pain, how would it make you feel? Unless you have titanium skin, it would make you very angry. But it wouldn’t make you angry because you have an anger disorder. It would make you angry because you are in pain and someone is poking you repeatedly. That’s what misophonia can feel like. If we can see or hear a disability or disorder people tend to ‘get it’. Unfortunately when it comes to neurological disorders it’s harder for people without the disorder to understand. If people could see the nerve centres lighting up our brains when we hear certain misophonic triggers it would go along way to demystifying the condition. It would make more immediate sense to people. The good news is we can do this in expensive laboratories using fMRI scans, but obviously this information isn’t always readily accessible to family and friends. Misophonia can be a cruel disorder. It often creates upset and tension and divisions in our relationships through misunderstanding. When someone with misophonia reacts irrationally to a certain sound it’s not because they have an anger disorder. It also not because they are angry with who that person is. It’s because that sound (whether it came from their mum, their colleague or best friend) has involuntary triggered a ‘freeze-fight-flight’ response. If we can be mindful of the condition and to acknowledge how strange and unfamiliar it must seem to others we can avoid a lot of hurt and misunderstanding. We can help them to understand the disorder and realise that this not something they’ve done. When we run away, or stick our fingers in our ears it’s not because we are angry or upset with them as people – it’s the sounds. Need to learn about this for my grandaughter’ssake. I’m 48 with monophonic. I tell my husband it’s like turrets. I hear it and I immediately say something negative. I don’t mean it. Don’t argue or make a reply. For some reason it’s a release just to say something. Please be understanding for her same. Don’t take anything personal. She doesn’t want to say anything anymore than you are doing it on purpose. Fantastic wonderfully informative article!!! Thank you so much!!! As a misophoniac I understand this much much better!!! Thank you for your kind words Chris! I completely agree, avoiding words like anger when describing the condition to others and framing it as a sound processing disorder is (in my opinion) by far the best and most accurate approach. This article gives a good description of subjective experience of some forms of disturbing noise, and what’s happening in the brain. I have particular trouble with loud, high-pitched sound — unfortunately exemplified by the piercing tones of eg kids screaming and yelling, and very often of adults too. I listened carefully to high-pitched women’s voices speaking (I think) Polish directly behind me in a bus, and as this piercing sound reached a certain volume, it was like an amplifier turned on inside my ear, or the sound hit a resonant frequency. Even wearing earplugs only takes the edge off. Hi Gabriel. I tend to headphone up on public transport but do find noisy bus folk very difficult, so I feel your pain. There’s another sensory condition called ASMR (which some misophones also have) where patients find that certain sounds and voices – often eastern European accents for some reason – can invoke a pleasant tingling sensation. Like tiny bubbles on the skin. Obviously it’s having the opposite effect in this instance, but I think it’s an interesting correlation! I too have problems with high-pitched sounds, e.g. children screaming or loud music. There are times when I would love to be able to relax in my garden but feel compelled to stay indoors because neighbours’ children are playing noisily outside. It’s even worse when they have music playing as well. If only people could understand & not think I’m being grumpy, & dislike children! Thanks so much for this article, Tom. You really hit the nail on the head. I hope I can get some of my friends and loved ones to read it too. You’re so welcome Julie, hope it helps. Can’t tell you how relieved I am to have learnt this today. I’d always put it down to ptsd (my major trigger is car horns from a serious road accident some years ago). But I find any loud, unexpected noise almost painful and my reaction to it so aggressive. Thank you so much for this! This sounds more like Hyperacusis, what you are describing. 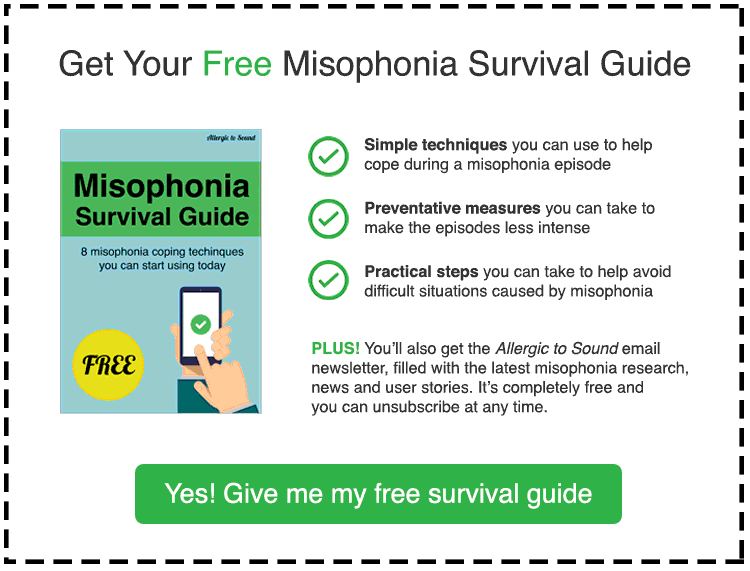 With Misophonia the sound doesn’t have to be loud, the sound can be barely perceptible and there will still be a misophonia reaction. And there is not necessarily physical pain in the ear with misophonia, that is hyperacusis. Your description fits Hyperacusis perfectly. The two conditions can be confused with each other. They can also co-exist (I have both). So glad it helped Ange! As Nick points out below it sounds like you could have Hyperacusis. I have this too (I seem to greedily collect sensory disorders). You can actually get diagnosed for this one by an audiologist if you ask for a referral from your GP. There’s not a great deal they can do at present but it can be quite helpful to know! To put it simply; GREAT ARTICLE! Thank you for your really helpful description of the difference between primary and secondary responses to disturbing sounds in misophonia. What really strikes me about the combined experience is the “lack of control” in a “hostile environment” that covers the whole gamut of negative emotions that disturbing noise can elicit — from panic to rage — as something that seems impossible for most neurologically “normal” people to understand. But unfortunately (in my experience) this is often because they don’t WANT to “understand” — because that involves accepting a request to modify their behaviour on grounds they prefer to View as excessive an unreasonable. “You are hypersensitive” or “I am not going to organise my life around you” or simply “f*** off” has most often been the response from upstairs neighbours even where non-misophonic sound disturbance is involved (as witnesses agree) knowing there is no sound insulation in a party floor, but playing heavy metal rock at disco volume with loudspeakers on the floor. This describes 22 years of hell (unable to move) living under a succession of noisy tenants and owner-occupiers alike. Attempts at polite explanation were least likely to be taken seriously: only rage got through… to my regret at being driven that far. Thanks Gabriel, I’m so glad it helped. Ugh, I really feel your pain re: noisy neighbours. We’ve recently had our crumbling mid terrace house refurbished and used the opportunity to get it as sound proofed as is possible. It was the best money I think I’ve ever spent – even if I’ll be paying the loans off forever! If you’re unable to move, it can help placing bookshelves (needs to be filled with books!) in particular noisy areas or (and this one is less effective) draping thick material to help soak up the sound. You could even try making a feature of wall out of that quite cool looking, space age foam egg carton stuff that they use in sound recording studios. It’s surprisingly inexpensive. Well done for investing in acoustic insulation — money extremely well spent. In a way I hope you don’t remember to appreciate the lack of disturbance, by being able to forget it! This means for separately owned occupancies, either agreement between owners for structural treatment e.g. a “floating floor”: I tried repeatedly for this at my own expense, but was refused as it involved also altering heights of doorways. Similarly NO to better carpet underlay — paid for by me. So all that was left was behaviour modification (i.e. reduction of noise at source as first principle of acoustic design) — NO again, from every upstairs occupant of a transit camp. The only thing I was spared was overhead laminate floors, pushed by a generation of TV makeover artists for profit, and new source of misery for hundreds of thousands of flat-dwellers: they ought to be banned. Basses van dear Kolk and Stephen Porges have done very interesting work on PTSD and encoding of trauma into muscular and nervous systems. Porges’ “Polyvagal Theory” identifies the life-threatening “freeze” response with a reptilian brainstem origin (an ancient unmyelinated branch of the vagaries nerve, that cuts out the prefrontal cortex, rational processing and language) where “fight-or-flight” response is mammalian, more recent in evolutionary terms. So far as misophonia might be inherently higher-than-“normal” sound processing sensitivity to certain kinds of sound (some idiopathic but much of it characteristically shared) it does seem likely also to represent vulnerability to being further traumatised by distressing and uncontrollable experiences in a “hostile environment” on a fairly Pavlovian basis: conditioned responses. Some days I cannot face getting on a bus even with earplugs… must try headphones too! Sorry I meant Bessel van der Kolk’s work on PTSD — didn’t see the annoying alterations made by my intrusive text-predictive function. Ackh, Impact noise is a nightmare if you’re in a flat conversion. I have friends who have spent a small fortune trying to address just that and it’s done very little to help. As you say any attempts to make significant structural changes to address the problem (e.g. floating floor) are usually scuppered by freeholders, tenants, housing assocs etc. Many thanks for the note re: Bassel van der Kolk and Porges. I’ve come across the Polyvagel Theory – I think there’s a link to it buried somewhere on this site – and found it very interesting so will have to check out Mr Van der Kolk too. I do agree with your sentiment re: repeated traumatisation exacerbating the problem. My personal belief is that miso is a neurological disorder and that certain sounds will trigger us regardless – whether that’s due to a synaesthesia like sensory mixup… a hypersensitivity in the amygdala (where it’s processed) or the auditory system (where it comes in) or a combination. But like with anything there are layers on layers. So you have that neurological foundation as a bedrock… but then life adds it’s own baggage on top. Certain stress points (e.g. strong misophonic experiences) being repeatedly triggered like Pavlov’s dog could add conditioning to the mix. For me at least, it’s mainly anticipatory and it’s this that then makes the event itself amplified. So for example I find myself in a situation where I know my colleague is about to release a barrage of triggers (if he brings in a bag of apples or I can see there’s soup in the fridge for his lunch). I’m then subconsciously on high alert because I know his routine. By the time he starts eating I’m already strung out from all the anticipation and the knowledge that it’ll go on for X minutes etc. That might apply to your bus scenario. You know/expect that you might be exposed to certain triggers and that you may have a hard time blocking them or getting away. As such you’re confronted with further layers of anticipatory stress and discomfort. In summary, yes, try headphones! Oh dear, sorry to laugh about your colleague’s dreaded bag of apples or soup in the fridge… I know exactly what you mean about being “already strung out from anticipation and knowledge it will go on for X minutes etc”. And don’t know any answers: except I still find it slightly amazing that, directed by an Alexander Technique teacher to take out my earplugs on buses (a horrific suggestion) and to focus on relaxing, with the idea that “I can take this” and an attitude of interest, I did actually a few times find myself able to tolerate extraordinarily high levels of noise, with people yelling quite close to me. It’s the unexpected, startling yells etc that are much harder to take. Yet though I read somewhere that one can never get habituated to sudden noises, actually (in my experience) that’s not true: it depends how often & with what intervals they get repeated. But there is often a different kind of accommodation: muscular tensing up — against the anticipated next shock — and if this becomes habitual, below the threshold of awareness, it can result in e.g. insomnia, and Fibromyalgia (which I’ve had for 15 years). Both are characteristic “stress” disorders, with the usual endocrine imbalances. And I am now pretty sure that FM is a form of PTSD: but this makes it treatable by means such as Alexander Technique, yoga, dance etc — which Bessel van dear Kolk describes well in his book “The Body keeps the Score”. There are also loads of clinical studies on his website, for free. And a number of very interesting videos by him and by Stephen Porges (mostly interviews, or conference addresses) on YouTube. The bodyworker Peter Levine is another who works in the same field of trauma — they recommend and introduce each other’s books: “Awaking the Tiger” is a good introduction to Levine’s work (and I found der Kolk and Porges via Levine). I think you are probably right about misophonia being an inbuilt hypersensitivity of the amygdala — though its immediate function is “noticing” a stimulus / event that needs attending to, as a possible threat, apparently it’s usually social or other conditioning that determines how the stimulus is interpreted: threat or other. And there is interesting work by Rue Hass using EFT — Emotional Freedom Technique or “Tapping” on acupuncture points — as a means of desensitisation to learnt traumatic triggers. But Rue Hass & others (Elaine something) also try to emphasise that hypersensitivity can be asset to society: we shouldn’t regard ourselves or allow ourselves to be labelled by others just as misfits, pathetic, nuisances etc. Do you know of any studies of heritability of misophonia? Because if heritable that might tend to point towards inherent sensitivity: and even epigenetic changes are heritable. I am intrigued that my mother and her sister were both hypersensitive to sound, and so is one of my cousins, their brother’s son. But then I wonder whether my own childhood training to be ultra-quiet — to accommodate my mother’s hypersensitivity — is the foundation of my own intolerance of other people’s noise: rather than inherited hypersensitive. And of course it could be both! But as to treating the layered result, there do actually seem to be a number of interesting modalities worth trying. Meanwhile, in buses it’s going to be headphones! Regarding the sudden noises issue, I have this too. I wonder if this could relate to hyperacusis (discomfort at loud sounds)? I’ve been diagnosed with this and if you speak to your GP and get a referral to an audiologist they can run some tests to see if you have it as well. It sounds like you might do! To be honest there’s not audiologists can do for us here other than nod, smile and recommend a book or two, although they do recommend special earplugs that reduce rather than block out sound. I’m in two minds about using earplugs for miso and prefer using earphones and playing music instead. The reason being that when I block out sound completely it seems to make me even more sensitive to sound when I later remove the earplug. It’s worth testing different approaches though as I’m sure different coping mechanisms will work better or worse for different people. That’s very interesting you’ve looked into the AT, yoga etc to deal with the associated stress. I get terrible back pain which I know is stress related (for which I sometimes do Pilates and acupuncture). I know a number of readers suffer from an array of physical ailments as well. Thank you for the book recommendations. I’ll try and put them on the site somewhere as I think this would be useful for the miso community to see as well. Re: the heritability of misophonia. Off the top of my head I can’t remember seeing any specific studies relating to this, but I would be extremely surprised if there wasn’t a genetic link. A good friend of mine has miso and her daughter has it. In my case – though I never met him – my mother tells me that my grandfather was very hot tempered about sound. I’ve also had a number of readers say that their parent or sibling has it. While it certainly doesn’t seem to be inherited in all cases, but I think there’s enough prevalence to suggest that there could be a genetic link! Bloody hell, “VAGUS nerve” also got changed to “vagaries” but I didn’t notice — sorry again! Great article. This is exactly how it feels. My trigger is mouth sounds, like chewing, gum popping, licking, etc. Most people I’ve revealed my disorder to don’t get it; some, even loved ones, thought it was funny to provoke me on purpose. I do find it helpful to describe it as a “stress response” rather than anger, even though the anxiety I feel is mostly blind rage, because people do tend to judge me crazier if they link it with such an emotion. Noisy chewing of food or gum, sniffing/snorting, loud finger licking are my main triggers. I mostly exhibit the flight response but when that avenue is not available I tend to give people ‘the look’ and they probably think I’m crazy. I do find that there are times when my tolerance is a bit higher but most of the time I get incredibly anxious and after a few minutes of hearing the offending sounds, I feel exhausted. I tend to prefer being alone most of the time because of this disorder. What a lovely comment, thank you! I’m thrilled that you found this article helpful and hope things improve with your dad.